1. Conventional Wisdom Voting and Scenario: participants in teams categorize the Events into “highly likely,” “highly unlikely”, and “uncertain. Facilitators use event voting to create a Conventional Wisdom scenario that reflects the overall thinking of workshop participants at the outset of the workshop. 2. 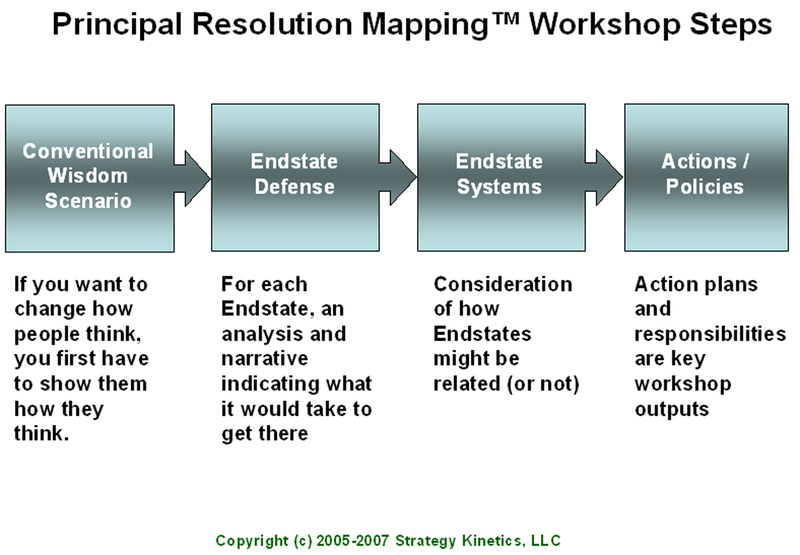 Endstate Defense: Each team analyzes and then defends their assigned Endstate in a presentation to the whole group. The main purpose of the team presentation is to present a narrative describing how the world evolved, including the key actors, drivers, motives, and significant milestones along the way. 3. Endstate Systems: Workshop participants develop a new model that synthesizes the Endstates into a set of relationships indicating how the Endstates might evolve and interact with one another. 4. Policies and Specific Actions: Participants identify and prioritize key policy initiatives and Events, including responsibilities for influence or implementation.